Arizona Christian Worldview Institute's new division, ACW Publications, has released its first book, Just Enough Grace: Reflections on Ordinary Miracles by Heather Nations [learn more about it and read an excerpt here]. Here's Part Two of an interview I did with Heather via email. [Read Part One here]. 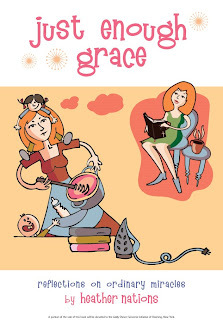 Just Enough Grace is divided into three sections - sort of three phases of your life. The second section is "Just Enough Grace for Cancer." Any favorite entries from this section? Okay, yes. :-) I like "Shock and Awe” (p. 89). I loved the fact that, in the middle of some of the worst circumstances of my life to date, God showed Himself in a very tangible way. He didn't take away the situation, but he constantly reminded me of his love. HIS goodness didn't change, despite my upheaval. As you've re-read this section now, several months after the events, is it difficult to read? Absolutely. I think all of us (we're all co-survivors at the Nations' house) have experienced a bit of post-traumatic stress. Dave and I were so busy trying to keep all of our plates spinning that we often didn't take vital couple time during my treatment, and many things were left unsaid that we're just starting to scratch the surface of now. I'm also amazed at how much I chose NOT to write during that time. Some people considered me to be relentlessly upbeat--I wasn't. I was aware that my daughter follows my blog, and I didn't want to deal with the topics like my humiliation at being bald, or my fear–not of dying, but of leaving my children and husband alone. What are a couple of things that God taught you during this phase of your life? --True friends and family stick with you, even when things are scary or ugly. We saw amazingly loving responses from family and friends who literally dropped everything to serve us during this difficult season. However, you have to be willing to let people help you, even if it means appearing vulnerable. --It's important to leave a legacy. It comforted me to know that there was a record of this time for my children. If I didn't survive, they would have something tangible to read about how much their mom loved them, and hopefully they would take away that I was at peace with God's will, even if it meant dying. --Humor is a gift. If I could laugh at myself, it was a good day. Blessedly, I was surrounded by people who loved to laugh as well. Have your relationships or priorities changed as a result of your trip through "Cancerland"? If so, how? I think I've become a person who is more willing to extend grace to others. I also try to keep a long-range perspective on what's truly important...having crunchy carpet or fingerprinted windows doesn't set me on edge the way it would have at one time. I heard recently that life's crises can make us "bitter or better.” I do think that our perspective becomes more focused--either on ourselves or on God. My prayer is that my focus stays on Him--not just through cancer, but in everything. What's the latest update on your health? So far, no news is good news. I have CT scans every four months and the last one (August 11) was clean. I return for a checkup on December 15. Recovery from the amount of chemo I had has been interesting. Physically, I consider myself to be at 80% of my pre-surgical/treatment energy, pain, and stamina-- and I hear that this is actually ahead of the healing curve! I have some short and long term memory issues, but most of the time they're more humorous than concerning. Have thine own way, Lord? FINALLY! The Book is Here!